Published: Oct 5, 2017 · Modified: Apr 12, 2019 · By Jen Sobjack · This post may contain affiliate links. 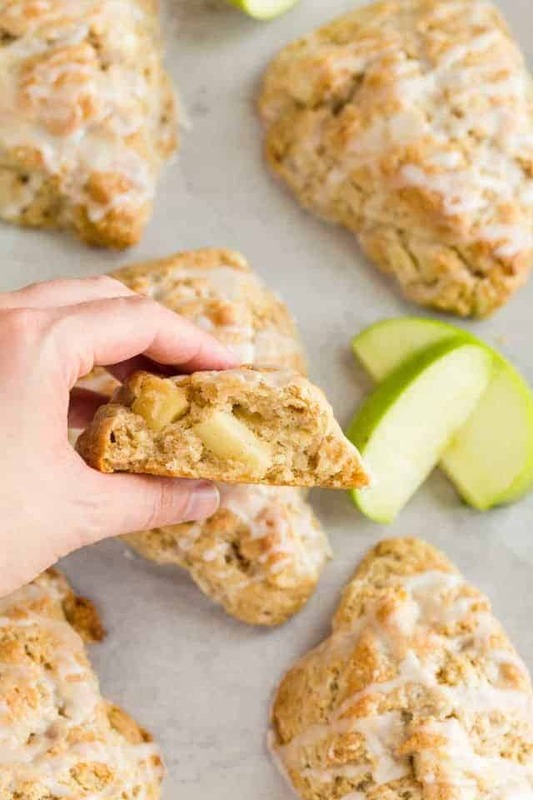 Light as air and crumbly, these apple cinnamon scones are packed with chunks of apple and spicy cinnamon. The scones are made with a basic buttermilk scone base so the texture is supremely tender. Fall is on one of my favorite baking seasons. All the cozy and warm spices, apple, pear, pumpkin, and everything that screams comfort. I just adore it! The evenings have begun to cool down and I can definitely feel the crispness of fall in the air. It’s perfect apple picking weather. And with those apples, you can make baked apple fritters or apple cinnamon scones. Just the kind of breakfast I enjoy! 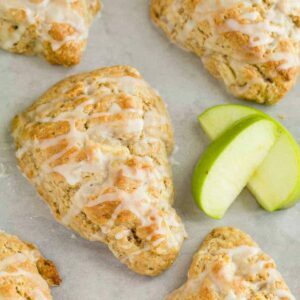 This recipe is so similar to my chai pear scones. If you liked those, you’ll definitely love these. Today’s apple and cinnamon scones recipe yield ultra thick and buttery scones with soft flakey centers. The ultimate texture and flavor combination. I have already shown you how to make soft scones. I took my plain scone recipe and added bits of crunch apple and cinnamon to make the perfect satisfying breakfast. My base scone recipe is the best I’ve tried and I’ve made a fair amount of scones in my lifetime. It can support just about any add-in you choose. I love making scone dough with buttermilk. It’s the only way to achieve those soft centers that are supremely moist. The outside of the scones bake up golden brown and crisp with delicate crumbs in each bite. Once you master scones, you will want to make them all the time. Handle the dough as little as possible. It does require some kneading but take care not to overwork it. Knead it just until it comes together and holds its shape. Overhandling the dough will also cause the butter to warm up and melt. You need those little bits of cold butter throughout the dough to ensure the texture is soft in the center. I like to freeze my scones for 30 minutes before baking. This helps to make sure the butter is super cold and it prevents spreading. Brush the tops of the scones with heavy cream for a crispy top. Sometimes I like to sprinkle the tops with coarse sugar for extra crunch and flavor. A hot oven is a must! This will cause the scones to rise tall and turn gorgeous golden brown. You can cut the scones any way you like. I always slice mine into triangles. That’s more out of habit than anything. But you can certainly roll the dough out and use a biscuit cutter to cut small rounds. Take care when doing this though. It’s easy to overwork the down with rolling. Cut the apples into small bits so they cook all the way through and become soft. Or if you’d like a crunchy apple texture, cut them slightly larger. The glaze is a simple mixture of confectioners’ sugar and apple juice. I love the added apple flavor from the juice. You can use milk or heavy cream with a teaspoon of vanilla. In a large mixing bowl, whisk the flour, sugar, baking powder, baking soda, salt, and cinnamon together. Cut the butter into the flour using a pastry blender, 2 knives, or your fingertips. The mixture should look like coarse crumbs. Gently fold in the apples. Whisk the vanilla and buttermilk together and gradually add it to the flour mixture. Stir just until the dough comes together. You may not need all the buttermilk. Add a little at a time until the mixture is moist but not too wet. Do not over mix the dough or the scones will be tough. Transfer the dough to a lightly floured surface and gently knead the dough four or five times. Pat the dough into a 7-inch round circle. Cut the circle in half, then cut each half into four triangle shaped wedges. Arrange the scones 2 inches apart on a baking sheet lined with parchment paper. Place the scones in the freezer for 30 minutes. Position the oven rack in the center of the oven and heat to 400°F. Brush the tops of the scones with cream. Bake for 15 to 20 minutes or until golden brown. Transfer to a wire rack to cool and drizzle with glaze. Scones are best enjoyed right away. Add the confectioners’ sugar to a small bowl. Drizzle in just enough of the apple juice to create a pourable glaze. You can refrigerate the dough overnight then simply shape the scones and bake them the next day. You can keep leftover scones for up to 2 days in the refrigerator. Unglaze scones can be frozen for up to three months. Thaw in the refrigerator overnight then reheat and glaze before serving. 1. Milk or heavy cream can be used in place of apple juice. You may want to add a teaspoon of vanilla and/or cinnamon for flavor. 2. This recipe yields 8 large scones. For smaller scones, cut the dough into 16 pieces instead of 8. Watch the scones closely as they bake because smaller scones may require a shorting baking time. These were so good!! Thanks for the recipe. I made these and they’re amazing! I used apple cider in the glaze instead and I bet that was even better than apple juice. I made the Apple Cinnamon scones. They were delicious with a crisp outside and soft centre. Looking forward to trying more of your scone recipes Your recipe was very easy to follow with implicit instructions. Well done. I’m so happy to hear the recipe was a success! The directions call for adding ginger, nutmeg, and cardamom but these items and amounts are not listed in the ingredients list. That’s because I copied the instructions over from my chai pear scones. I’ve corrected it and thank you for pointing this out! Hi! I used regular whole milk and they came out fine. This recipe’s ingredients can be reduced by 1/2 for smaller batches. Quick and easY. Gah! Thank you for pointing that out. 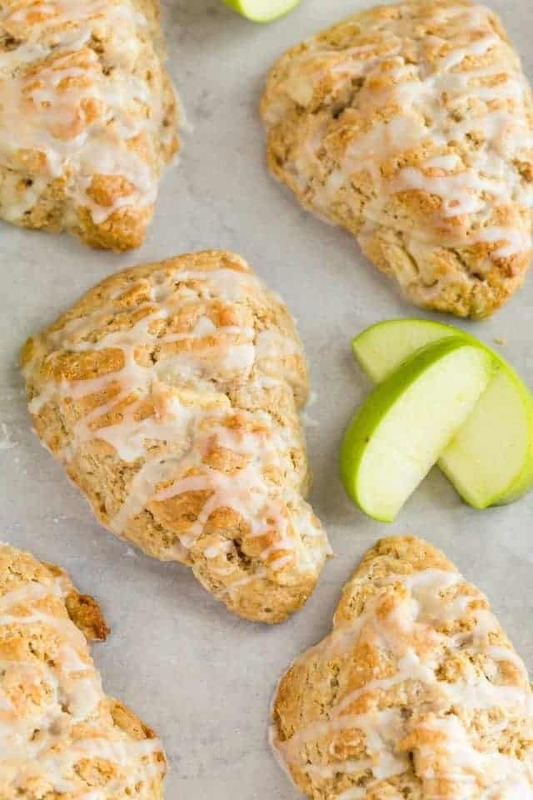 I adapted this from my chai pear scones and totally had pears on my mind. Haha! These sound perfect for fall! These look absolutely fabulous! Such perfect texture. Oh my goodness these look spectacular – this and a cup of coffee are all I need to start the day! I love your applesauce scones. I have used applesause inplace of oil in some baking I’ve done. I was wandering if you had any recipes for applebutte. I eat it on bread or toast but been trying to come up with cupcakes or any baked treat, that you use applebutter. I think would taste great. Thanks hope you might come up with something. Love your recipes. This apple cider coffee cake uses apple butter for filling. That’s the only recipe I have for now but I will make a note to add more to the archives. Thank you for the request! these scones look amazing! Pinned! Oh, so it is officially fall? I can’t believe it! But I’m very excited about these scones! Love the flavors and will try them soon! Jen I love apple scones and what better than apple to welcome fall?!! I need to make these to have with my coffee! 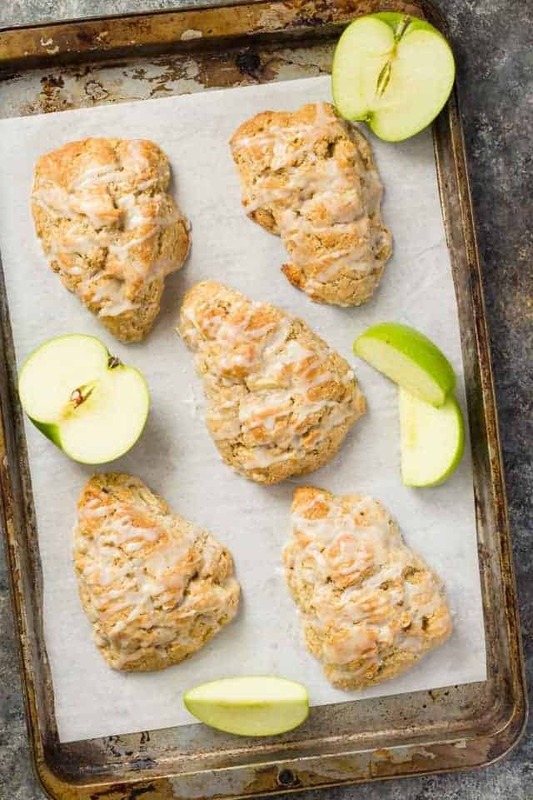 These scones look delicious- love the glaze and obsessed with apples this time of year! These scones look perfect, Jen! This definitely screams fall and all things delicious. I’m not a fan of dry scones either, so I love how soft these are! Gorgeous pictures, too!